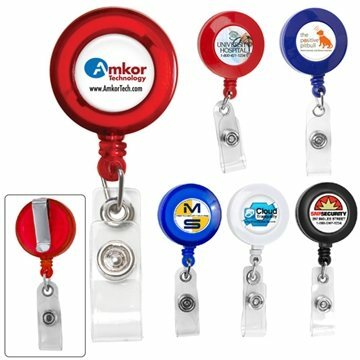 30" Cord Round Retractable Badge Reel and Badge Holder with Metal Slip Clip Backing﻿﻿. Please Note:Direct Print - Slight shifting of logo/text cannot be avoided. As each product is manufactured and logoed individually, up to 3/16" movement in logo alignment may occur. 4CP Vinyl Label - When printing on white vinyl label small bubbles and variation in vinyl label application alignment cannot be avoided. There may be a dramatic difference between the PMS color noted, screen color shown and printed color. In 4-Color Process printing, exact color match cannot be achieved. Products are intended for individual use and cannot be compared one to another. These are perfect for our team members! The quality is better than expected and the pricing was perfect. I will re-order when I run out of my current supply. I did not realize the imprint would be a sticker. This product would be perfect if the image was actually printed on it. Item and imprint turned out perfect, everyone wanted one. Thank you for the excellent customer service.